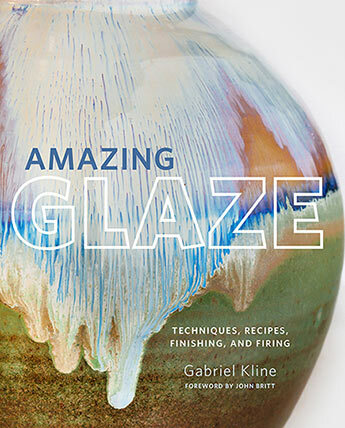 In Amazing Glaze, you will learn to love glazing with a variety of techniques, sure-fire recipes, and inspiring work from some of today's top ceramic artists. Whether you look forward to glazing your work or are guilty of saying "I hate glazing!" Amazing Glaze is for you. Join author and Odyssey Clayworks founder Gabriel Kline on a journey that makes glazing less intimidating and more fun. Start in the "glaze kitchen" where youll set yourself up for success, then move on to learning the tools and techniques for glazing right every time. Along the way, Gabriel shares dozens of tried-and-true recipes and combinations for both mid-range and high-fire. The recipes and the foundational techniques here are just the beginning. Learn about layering with slip and underglaze, work with resists, and combine techniques to take your glazing above and beyond. Whether youre after crystalline effects, an elusive red, or a crash-course in applying luster, its all here. A variety of artist features and stunning gallery work from todays top artists will leave you inspired and ready to get glazing! Gabriel Kline is a professional potter who has taught ceramics classes for nearly two decades. He is the founder of Odyssey Clayworks, an educational institution affiliated with Highwater Clay—one of the largest clay and ceramic materials companies in the United States. Gabriel is also the resident artist program director, fostering connections with university programs and up-and-coming artists from around the world. His work has been featured in numerous publications including Ceramics Monthly, Ceramic Arts Daily, and in books such as The Complete Guide to Mid-Range Glazes and Mastering the Potter's Wheel.